Average market hours of work in broadly similar countries across the OECD vary widely. For example, during the early 2000s, weekly market hours per adult aged 20-64 in the US were about 28, while they ranged from 19 to 25 in a sample of European countries. These differences in hours persist even after controlling for demographic differences between countries. Since the seminal work of Prescott (2004), economists have analysed in detail the role of taxes in accounting for these differences. In particular, the literature has found that higher taxes in European countries go a long way in accounting for their low market hours. Recent research has studied the role played by the non-linearity of tax codes, such as its progressivity and the treatment of married couples (Bick and Fuchs-Schündeln 2017), as well as the role played by divorces and taxes (Chakraborty et al. 2015). As a follow-up to that line of research focusing on taxes alone, Rogerson (2007) argues that the way in which the government spends the tax revenue is important for understanding the effects of taxes on market hours. One prominent example of this is the government subsidies on family care, which are found to be important in accounting for cross-country differences in aggregate market hours (Ngai and Pissarides 2011, Ragan 2013). In new research funded by the European Research Council, we show that the majority of the cross-country differences in market hours are driven by the hours of women, especially women without a college degree (Duval-Hernández et al. 2017). We also find that social subsidies for family care that lower the cost of outsourcing home production play an important role in accounting for women’s market hours. When calibrated to the data, social subsidies and taxes together can account for a substantial fraction of the cross-country differences in market hours by gender and education. 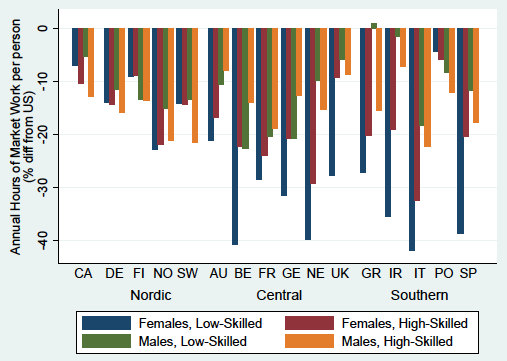 Figure 1 displays the percentage differences in annual market hours per adult for various European countries relative to the US for different gender-skill groups.1 In most countries, the largest percentage differences occur for low-skilled women, and the differences are larger for women than for men with the same skill level. The exceptions occur for Nordic countries, Canada, and Portugal, where the largest proportional differences are observed among high-skilled men. Note: Hours are adjusted for demographic differences across countries. Low-skilled individuals are those without a college degree. Data cover years 2000-2004. Note: Hours are adjusted for demographic differences across countries. Data cover years 2000-2004. We show that taxes are negatively associated with market hours for each of the gender-skill groups. More importantly, when account is taken for the presence of social subsidies for family care, such as childcare and elderly care, this negative association becomes even stronger for low-skilled women. A similar negative association is also found for all sectors of the economy, but is especially large for the substitutable service sector. Motivated by these empirical findings, we develop a multi-sector model to study the quantitative effects of taxes and subsidies on market hours. The model consists of three market sectors producing goods, non-substitutable services, and substitutable services. It also distinguishes four types of labour inputs, male and female with low or high skill, and production in each sector involves all four types of inputs. A representative household allocates time to market work, home production, and leisure for each gender-skill group. As taxes increase, households reduce their market hours and devote more time to leisure and home production. The reduction is larger for women than for men, because home production is mainly performed by women. As low-skilled women have lower wages, and therefore the lowest opportunity cost of not working in the market, the shift of time away from the market is the largest for them. Moreover, the reduction in market hours is also larger for the substitutable service sector, because this sector produces close substitutes to home services. In contrast, social subsidies on family care reduce the price of substitutable market services, and thus increase the incentive to marketise home services, which results in more female market hours, especially among the low-skilled. 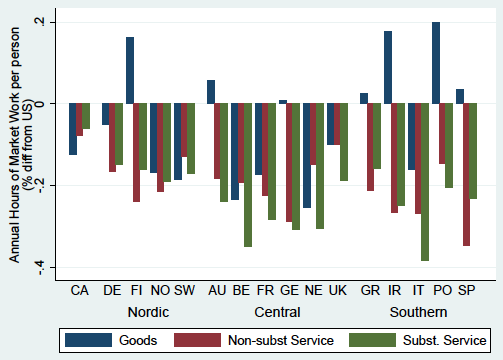 Social subsidies help to reconcile the labour supply patterns observed in Nordic countries, where both taxes and subsidies are high, and women have relatively high market hours of work. Our mechanism can rationalise why European countries have a smaller gender wage gap. In particular, the fall in the relative supply of female market hours in countries with high taxes reduces this wage gap. Quantitatively however, taxes and subsidies fall short of accounting for the large variation in gender wage ratios across countries. These results suggest that other complementary factors such as labour market institutions, culture, and discrimination are important for understanding the cross-country differences in the gender pay gap (Blau and Kahn 2000). This line of study has implications that go beyond the European context and that more generally concern the types of policies that can be used to promote the participation of women in the market. For instance, the International Labour Organisation (2016) documents that the gender gap in employment is much larger in many developing countries, and as in the case of Europe, women do most of the housework. Our own research highlights the key role of policies that reduce the cost of marketising home production, such as subsidies on family care. This seemingly gender-neutral policy is effectively gender-biased, given women's greater involvement in housework activities. Future research should explore other policies and mechanisms that could potentially affect the gender-employment gap. For example, European countries are gradually relying more on various forms of tax credits and exemptions to finance the purchase of care services in the private sector. Based on our research, these policies are likely to have an impact on the labour market participation of women which are as yet unexplored. Editor’s Note: The views in this column represent those of the authors and should not be attributed to either the Federal Reserve Bank of Atlanta or the Federal Reserve System. Bick, A and N Fuchs-Schündeln (2017, “Taxation and labor supply of married couples across countries: A macroeconomic analysis”, The Review of Economic Studies forthcoming. Blau, F D and L M Kahn (2000), “Gender differences in pay”, Journal of Economic Perspectives 14(4): 75-99. Chakraborty, I, H A Holter and S Stepanchuk (2015), “Marriage stability, taxation and aggregate labor supply in the US vs Europe”, Journal of Monetary Economics 72: 1–20. Duval-Hernández, R, L Fang and R L Ngai (2017), “Taxes and market hours - the Role of gender and skill”, CEPR, Discussion Paper 12292.
International Labour Organization (2016), Women at Work: Trends 2016, International Labour Office,, Geneva: ILO. Ngai, R L and C A Pissarides (2011), “Taxes, social subsidies, and the allocation of work time”, American Economic Journal: Macroeconomics 3(4): 1–26. Prescott, E C (2004), “Why do Americans work so much more than Europeans?”, Federal Reserve Bank of Minneapolis Quarterly Review 28(July): 2-13. Ragan, K (2013), “Taxes and time use: Fiscal policy in a household production model”, American Economic Journal: Macroeconomics 5(1): 168–192. Rogerson, R (2007), “Taxation and market work: Is Scandinavia an outlier?”, Economic Theory 32(1): 59–85. The country nomenclature is as follows—Canada (CA), Denmark (DE), Finland (FI), Norway (NO), Sweden (SW), Austria (AU), Belgium (BE), France (FR), Germany (GE), Netherlands (NE), United Kingdom (UK), Greece (GR), Ireland (IR), Italy (IT), Portugal (PO), and Spain (SP). In this figure the substitutable services include activities in retail trade, hotels and restaurants, health and social work activities, as well as other miscellaneous personal, household, and community services.